This is our GSD Lily! She is our 6 mo. & 3 wk old German Shepherd Puppy. My fiance Michael and I purchased her shortly after our engagement. She was only 8 weeks when we got her from a breeder and within a week became very sick. After many visits to the vet, antibiotics, several shots, and syringe feeding her food and water for over 2 weeks she finally built up her strength and came back to life! Both of our parents suggested that we return her to the breeder, but there was no way we could give up on out little sweetheart. It ended up that pills the breeder had given us to give to her were prescribed incorrectly. She told us that Illinois state law required her to give them to everyone who purchased a dog from her. The pills were to protect the dogs from any diseases they could have picked up from drinking out of water dishes kept outside that birds may have infected. It ended up that the dose she gave us for our little puppy was 2 times too strong for her. It was a very rocky first month with Lily, there were days I thought she may die in my arms. As week and listless as she was, she put up fights as we forced her to eat and drink. But Michael and I did everything we could to get her well and we succeeded. Even our vet was amazed at the comeback she made! Today Lily is a healthy German Shepherd Puppy! She is getting bigger and bigger and is full of energy! She enjoys her weekly training classes and loves to run around with other dogs at the local dog parks! She and Michael live together and our each others best friend. I only hope Lily will be welcoming of me once Michael and I get married and I join their home! She is a joy to both of us and we love her so much! 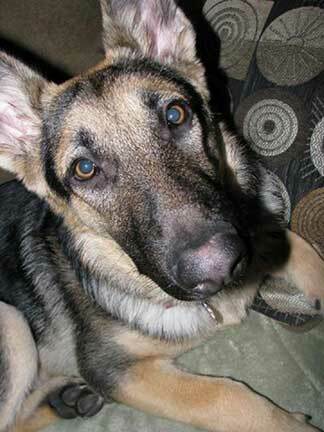 Thanks for listening to our story and for considering Lily as the GSD of the Month!